Ballmer And Bates Sell The Skype Deal: We Think We "Can Reach Everyone On The Planet"
In the wake of today’s news that Microsoft is buying Skype for $8.5 billion, CEOs Steve Ballmer and Tony Bates just held a press conference to explain the deal and sell it to investors. The reaction has ben tepid, with Microsoft shares down about 1 percent so far today. 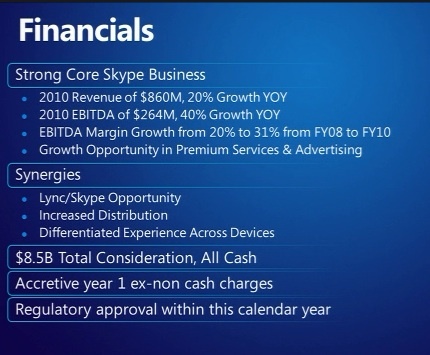 As I’ve pointed out, Skype is a great company, but there are concerns that Microsoft paid too much. In today’s press conference, Ballmer did a good job couching the deal in terms of Microsoft’s mission to bring people closer together through technology and make their lives better. “We will move beyond email and text to rich experiences. Talking to colleagues across the world will be as seamless as talking to them across the table,” he predicts. Skype will become a new division of Microsoft, with Bates reporting to Ballmer. The product and brand will continue to exist, and Ballmer promised to “continue to support non-Microsoft devices.” So all of you Android and iPhone Skype users can breathe easy. But Skype will also become integrated into a variety of Microsoft products: Windows Phone, XBox Live and Kinnect, Outlook, Lync, Messenger, Hotmail. It is clear that Microsoft sees Skype as more than just voice calls and IM. They made a point to note that 40 percent of Skype traffic is now video. (For instance, Ballmer imagines Skype and Xbox becoming “like a home video conferencing system, but one that costs just a few hundred bucks.”) Skype is being positioned as sitting at the nexus of mobile, social, and voice. Social is a bit of a stretch, but it does connect you to that “inner circle” of people you tend to talk to the most often. In terms of why Microsoft did the deal, Ballmer confirms my earlier speculation that it was really bidding against the upcoming IPO and figured it was cheaper to buy it now. 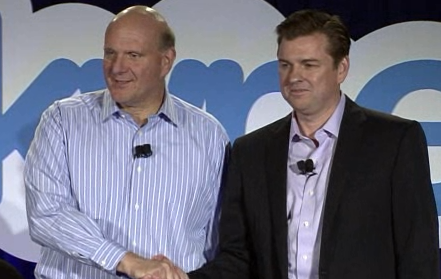 “Skype was on a path to IPO,” says Ballmer. “From our perspective it was better if we owned this company.” The offer was unsolicited, and went to SIlver Lake Partners, the lead investor of the syndicate that bought Skype from eBay 18 months ago.